Yes, you read our title correctly. This article applies to ALL eating disorders. Our aim is to provide an easy to understand Roadmap for charting one's progression into a disorder, and out of the disorder toward recovery. One of our clients described her eating disorder as being like wandering alone in an uncharted wilderness, not knowing where she was going or how to return to where she had been. There were no signposts and there was no guide. There was only fear, self-loathing, misery and the anticipation of more misery. That’s when she allowed herself to feel her feelings at all. For the most part, awareness of emotions was clouded by an all-consuming focus on food and weight. She felt stuck! It has long been evident to us that it is very useful for our eating disorder clients to have a sense of the progression of their disorder so they may clearly see a pathway leading from despair to recovery. Most eating disordered clients are too caught up in their illness to have a sense of direction or a vision of recovery, and this greatly adds to their distress and sense of hopelessness. Those with an eating disorder need hope and hope comes from understanding that they do not have a “disease for life,” and that no matter how badly they feel at the present time, there is always a way to move beyond present misery toward a happier and more productive life in the future. They need a Road Map. Accordingly, this article is about the journey of eating disordered individuals from first stages to a stage of recovery that only a few can imagine early in the process. Our intention is to draw a map that also provides a description of what the path looks like along the way. The first three stages characterize a descent into the disorder. The last three stages are about the journey upward to recovery. The article has been written to apply to a wide variety of eating disorders. Specific examples may not fit the individual reader, but she should find much that is relevant, regardless of her specific disorder. It may seem quite ambitious to tackle all eating disorders simultaneously. Actually, we find it very useful to look for commonality. Whether people are restrictive and undereat, or compulsive and overeat, all fear food, distrust their bodies, and have an unhealthy relationship with both their bodies and food. All experience shame when they don’t eat as they believe they should. All use food or the avoidance of food to manage uncomfortable feelings. All share a multitude of irrational beliefs. In all cases, the real issues are more about relationship to self, than relationship to food. All have deficits when it comes to healthy self-care. All are disconnected from the natural ability to relax and enjoy food– and life. They see food as something far more important in their life than simply fuel or pleasure. They see their bodies and control over their weight as about self-worth. They tend to feel anxious and helpless around food, and either out-of-control with food or terrified that they may lose control. They have difficulty tackling the real issues of their life or even in seeing those issues. 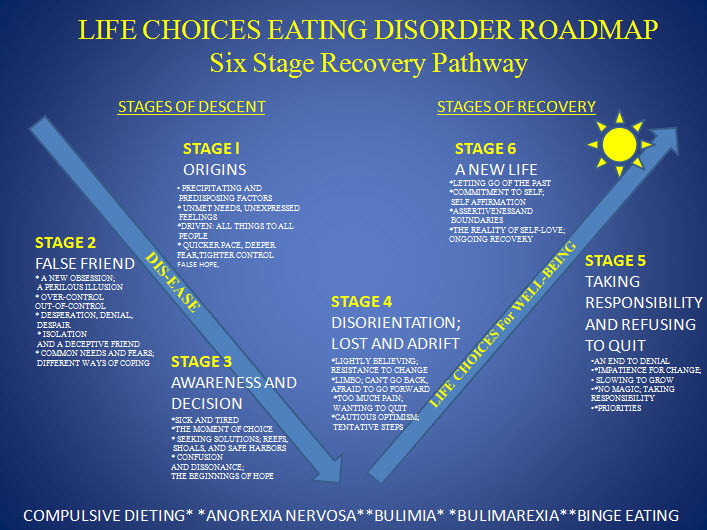 Stage One begins with a discussion of how the stage is set for disordered eating. For everyone with an eating disorder, the causes may be thought of as either predisposing or precipitating. Predisposing causes are cultural factors, family patterns, and individual characteristics. Probably all American females are at risk due to cultural factors which emphasize the extreme importance of thinness and a reliance upon dieting. Various family patterns also create a risk. There are chaotic families, abusive or neglectful families, enmeshed or detached families, addicted families, and “perfect” families. Virtually any family structure that creates a sense of insecurity about who you are or your worth as a person, or that creates difficulty in expressing needs and feelings without loads of guilt and anxiety, creates a risk for the development of an eating disorder. Additionally, factors within the individual, such as higher than average insecurity, self-criticism, anxiety, depression, or competitiveness create a risk. Precipitating factors can be any stressful event or change that seems overwhelming to the individual. These are factors such as: divorce, puberty, going on to high school, loss of a relationship, or literally thousands of other things that create undue anxiety. One way or another, the individual at risk arrives at a point where she totally believes that it is not okay to express her needs and feelings. It is not okay to ask for what she wants. It is not okay to get angry or complain. She is certain that it is a terrible thing to hurt anyone’s feelings or make anyone angry. People with an eating disorder, or those at risk of developing an eating disorder, usually believe they must please everyone. They believe the opinions of others are absolutely important, and that they should not make waves. They tend to have great difficulty with assertiveness, therefore building hidden resentments, feelings of powerlessness, and inward directed anger that results in lowered self-esteem and depression. These unmet needs and unexpressed feelings generate stress. Tensions build without any means of release or recovery of balance. Jane (real names are not used) has grown up being frequently described as “a perfect child.” Now fourteen, she is deeply anxious and constantly worried about letting her family down. She’s hyper vigilant, intensely searching for cues in their words and faces, clues that reveal what is expected of her. She has actually become very good at reading others and being whatever they want her to be. But now things are changing. Life is getting more complicated. There seem to be more opportunities for failure, and the expectations of others are often conflicting and confusing. So much pressure! Deep down, Jane is aware of anger and resentment - but these feelings are unacceptable. These feelings are dangerous. Jane will push them further down and resume her efforts to please, having long since lost touch with her own needs and feelings. The person with the developing eating disorder wants desperately to be accepted by others in order to be okay. Usually, she is hard at work as a “human doing” rather than a human being. She has come to believe that her worth depends upon fulfilling the expectations of other people, all of the time, and perfectly. She seems unaware of the impossibility of pleasing everyone and is committed to being what she thinks everyone else wants her to be. She thinks that if only she does better, performs at a higher level, and is even more consistently pleasing to those around her, she will be okay. She will have worth. She will be safe. Somewhere in this process, the thought occurs to a highly stressed and insecure individual, “What if I lost weight? What if I went on a diet? Perhaps then I would feel better. Perhaps then I would be more acceptable. Perhaps then I would feel more in control of my life.” At this point, events are set in motion that may result in years of misery. The initial goal is simply to see different numbers on her scale. At a deeper level however, she is needing a sense of control, popularity, achievement, and safety. Somehow she has decided that the quickest and easiest way to have these things is to have thinness. Not being thin constitutes failure. The solution seems clear. After all, she has been told all of her life that the way to be thin is to diet. Dieting will fix everything. Dieting means weight loss, beauty, and success, and therefore, non-dieting and eating must mean failure. As she begins to diet, she discovers that she loses weight and the weight loss gives her good feelings. It gives her a sense of success, mastery, control, and safety. She has made a very dangerous discovery. She has found that by controlling her body she can have a sense of control over her life where previously she felt life was frightening and unpredictable, with ever-present fear of failure and rejection. Now she tells herself things will be okay, that she will have beauty, success, popularity, and control if only she maintains a thin weight, or perhaps just a little thinner to be on the safe side. The major problem with dieting is that it creates a war between self and body. As our dieter persists with her attempts to lose weight by denying herself food, her lost weight is accompanied by an increased hunger and desire to eat. This is quite a dilemma. Her sense of control depends upon weight loss, but her body experiences deprivation of food as a threat to be resisted, as a dangerous “famine.” Her body’s defense is an increased drive to eat. The more she restrains herself, the more she wants food, particularly craving “forbidden” foods. She now enters into a rather strange mode of thinking. Her hunger seems limitless. Surely if she allows herself to start eating, she will not be able to stop. She will be insatiable. All is lost if she begins. Feeding herself now means failure. Janice has only one problem in her life, controlling her weight. At times, she believes it is under control. At other times, her body and her appetite just will not cooperate. She is trying desperately to stick to her diet. She knows that only heroic restraint can save her. But what if she loses control? Surely she will be insatiable. She cannot stop thinking of forbidden foods. Sooner or later, she finds herself in a binge. At last regaining control, she promises herself that she will redouble her efforts. She will try harder nest time. As the war intensifies, our dieter continues to “white knuckle” her way to a sense of control she has never known. She does not seem to realize that her fear-driven obsession is now crowding everything else out of her life. She knows only that her worth depends upon staying in control. Deeper issues are obscured behind a false sense of power. By this stage, some dieters are alternating between collapse into full blown compulsive eating and renewed attempts at heroic restraint. Some dieters have become bulimic with purging behaviors, such as vomiting, abusing laxatives or diuretics, or compulsive exercise. Others have developed even more restraint and have moved deeper into Anorexia Nervosa. Some are bulimarexic and starve, binge, and purge. All experience deeper fear and isolation, a greater sense of hopelessness, and chronic depression. Finally, there is an awareness that something is terribly wrong and getting worse. At some point, a decision is made to seek help. This decision is based upon the inescapable conclusion that things are out of control and that nothing will improve without outside help. For some, this is an early decision, while for others, this one decision may take years. This is definitely a case of “the sooner the better,” as difficulties in recovery amplify as years roll by. The moment of choice may be brought about by at last discussing the situation with friends or family. Sometimes it happens as a forced decision when others notice the problem and insist that the eating disorder person seek help. She may see a talk show or read an article about eating disorders and learn that help is available. However it happens, there comes a time when seeking help or choosing to continue in the disorder are the only choices. Linda awakens already dreading the day ahead. Yesterday was spent in a round of binging and purging that felt like a never ending and terrifying rollar coster ride. She promises her self, “Today will be different!” Despite her grim determination however, Linda already feels the tension building. Soon she will get in her car and round up her binge foods. Once she has begun, she may feel out of control for hours. Her life will become a blur as she binges and purges repeatedly. Another day of terror, shame, and despair! When will it end? There does not seem to be any way out. Everything that has been important to her seems crowded out of her life. She knows she cannot go on like this. She must find help. Peggy awakens in the emergency room. She had been trying to get in an extra aerobic session when she collapsed and frightened friends rushed her to the hospital. For months her family and friends have worried over her and repeatedly urged her to get help. Peggy cannot understand their concern. At 5’6” and 102 pounds. She has been aiming to lose just a couple of pounds more. In spite of her protests, the emergency room physician and her friends make her promise to check in with her regular physician and a therapist upon her release. Still determined to pursue her plan to lose those two pounds, she thinks that her agreement to see someone will at least get everyone off her back. Although some of these avenues may offer some help, none of these choices by themselves will result in recovery. Medication may be needed in some cases. Prayer is always helpful. Group support can be invaluable. Many do need nutritional advice. Some may need to relearn how to eat, and structure is important. There is much more to recovery, however, and our failed dieter will need a comprehensive program that helps her learn to have a solid sense of her own identity, greatly increased self-esteem, and the ability to deal openly and directly with her needs and feelings. She will need to learn many new behaviors, including conflict resolution and relaxation skills. She will need to learn how to make peace with her family and other important people in her life, while establishing a healthy autonomy. In short, recovery is a very complicated process, and her guides need to be those who are highly experienced in the treatment of eating disorders. Much of the advice and guidance that our failed dieter dieter receives will be confusing and conflicting. Bad advice or limited information may set her back. Most of our clients wander in the eating disorders wilderness quite some time before finally connecting with professionals who understand eating disorders. Often she has become so dismayed at the wide variety of solutions she has been offered, and the dead end avenues she has already attempted, that she finds it very difficult to trust in any therapist or program. However, hope springs eternal. There is always another program. At last, she connects with professionals who understand her. Joyce came today for her first appointment. Worried and tense, she is unsure what to expect. Will this program be different? Her last therapist had kept the focus on food, sometimes talking at length about her own trials and tribulations over food and weight. They just never seemed to get to deeper issues. She had liked her therapist and enjoyed the sessions, but they just did not seem to be getting anywhere. She’s heard that some recover but is not sure she believes that recovery can happen for her. Will this program help her? By the end of her first session, she feels tentative hope, and she has been invited to meet others with similar issues. It is anxiety provoking but also an intriguing thought. If there are others, and if they are making progress, maybe I . . .
She wants desperately to feel better but has difficulty believing her therapist that change is possible. Part of her fears change will only make matters worse. A familiar misery seems preferable to the unknown. Her eating disorder has made her miserable but has also protected her and helped her avoid pain, conflict, and anxiety. She fears losing this protection. At this point, clients are heard saying things like, “If I wasn’t bulimic, I don’t know what I would do with my time,” or “ What would I do with all these feelings if I wasn’t eating?” Yet she knows she cannot stay where she is at. Things have to change. With therapy, she begins to experience the disintegration of old defenses. Julie is confused. It seems as though everything she has believed is wrong -- or is it? In therapy, she is learning things like, “It’s OK to make mistakes,” and “ I don’t have to please everyone.” She is not sure she can trust this new way of thinking. She has always believed that she had to be hard on herself. “How do you improve if you are not self-critical?” She hears other in group talking of their progress but has not yet seen any for herself. She wants desperately to believe in recovery, but it is really hard to stay positive. This is the most difficult point in the process. As she lets go of old defenses, old illusions, she feels more vulnerable to emotional pain than ever before, yet lacks a clear direction. “What do I do? How do I change?” At last she has come to realize that her problem is not about her relationship to food. Instead, it is about her lack of relationship to self. She is shocked at the extent that self-destructive and self-negating beliefs color every aspect of her life. She feels overwhelmed at the intensity of the problem and is flooded with pain and anxiety that had been numbed and obscured by her eating behavior. She wishes she could go back, but she cannot. Her eating disorder will no longer work for her. She is afraid to go g\forward and does not yet know how. It seems impossible. She feels overwhelmed. Another decision! She knows she has an eating disorder and has decided to seek help. Now she must decide to continue. It seems to her that she has bitten off too much. She may be feeling worse than ever. It is hard for her to understand how she can be getting better and feeling worse. Her disorder has helped her avoid feelings and has protected her from pain. Now the pain is overwhelming and ever-present. She wonders why she began this journey. She wished she could escape it altogether. The uncompromising dilemma is that she cannot go back, but somehow she must find a way to move forward. Kate sits in our office looking tired and bewildered. She is having a hard time appreciating recovery or even believing recovery is what is happening. How can she be getting better when she is feeling worse? In fact, she is flooded with feelings that she was not fully conscious of before, feelings she does not know what to do with. There is more anxiety, more fear, more anger, and more awareness of old resentments and conflicts. How does anyone deal with all of these feelings? It seemed easier being in her disorder. Yes, it was an illusion, but an illusion that numbed feelings and provided a sense of safety and control. Kate knows she cannot go back but wishes she could. She cannot see clearly how to move forward and is frightened of change. When we describe “Stage 6,” she tells us it seems unreal, like a “fairy tale.” She feels stuck and sometimes wants to give up. Finally, there is hope. As she learns to recognize beliefs that have not served her well and begins to change those beliefs, she starts to see light at the end of the tunnel. It has become clearer that irrational ideas learned early in life have created an impossible situation for her. Now she is gaining the ability to recognize dysfunctional thoughts when they are occurring and to quickly change them to more accurate and positive thoughts. She is rapidly gaining understanding of her personal needs and an awareness and acceptance of her emotions. Trust and openness are increasing. Her fears are diminishing, and she is beginning to relax. As she begins to accept her personal limitations, her self-image improves, and she begins to experience, in a very tentative and cautious way, growing optimism. There is now no question that the problem is having an eating disorder, that the real issues do not involve food and weight, and that there is no alternative to recovery. The end of denial is not a sudden and total event, but rather takes place gradually throughout the course of her recovery. We frequently ask our clients to tells us on a scale of 1 to 10 how much they feel committed to recovery. Most of our clients are quite honest and will give us a number somewhere between 1 and 10. Only much later in the therapy process will they answer with a resolute and determined “9 or 10!” The reason for this is that recovery continues to be a frightening process, and only gradually, as optimism and trust increase, do fear and resistance ebb away. It is like letting go of and old friend or protector. In this case however, the old friend has been increasingly abusive and destructive, and it is finally time to let go. Gradually, the awareness has grown that it is better to be done with this old friend. There are much better ways of dealing with stress and living life. As recovery begins to accelerate, tentative hope grows into solid commitment. Pacing is important however, as many get ahead of themselves. Our recovering dieter has probably had a lifetime of believing that her efforts were not good enough. Now that she has embraced recovery, she may be quite upset with herself that perfect recovery has not already taken place. This impatience impedes recovery. There is no substitute for the “one day at a time” or “easy does it” philosophy from Alcoholics Anonymous. Recovery is hard work, probably the hardest work she will ever do. There is often a strong desire to have this work accomplished without pain or done for her by some magic therapist or program. She comes to accept that there is no special magic and that there is no other avenue to recovery but through her own intense effort. This is asking a lot of someone who has spent her life focusing on the expectations of others while feeling powerless to take care of her own needs. Somehow this shift must be made, and she must come to the inescapable conclusion that she alone determines the course of her recovery. Ann is working hard. Robin has told her in group that the work of recovery is the hardest work she will ever do. Ann agrees. She has made recovery her number one priority for the past six months, and it is beginning to pay off. Her sights are now set on other issues that must be faced. She is becoming more assertive with family and others, overcoming her fear of conflict and abandonment. She writes in her journal daily, despite intense discomfort at seeing her reality on paper. She monitors her self-talk, learning to be aware of irrational thoughts and beliefs, then confronting and changing them. It is hard work, but it is working. Three major obstacles confront our recovering dieter. First, she has to overcome a lifelong pattern of focusing on the needs and expectations of others. She is probably out of touch with her own needs and is conditioned to feel guilty and selfish focusing on her own issues. The second obstacle is a perfectionist mindset that makes everything in life a top priority. Consequently, she has difficulty putting her own needs ahead of a myriad of other concerns. The third obstacle is a natural resistance to dealing with painful subjects. After all, the very purpose of her food and weight obsession is to distract her from real issues and to serve as a focus for all of her thoughts and energies, thus protecting her from fear and self-doubt. For recovery to proceed, she must at last establish recovery as her consistent and unquestioned first priority. She must recognize that she can best nurture others only if she is well nurtured. Finally, she must accept the belief that the only way beyond her difficulties is to move through them with direct action and necessary pain. Recovery means a lifelong commitment to being your own best friend. It means being there for you regardless of whether others approve of you or not. It means looking at yourself in the mirror and saying, “This is me. This is the only me I will ever have and I am going to have to give myself love and encouragement, never again self-hatred.” It means unconditional self-acceptance and not self-acceptance dependent on weight or approval from others. It means never forgetting the lessons of recovery. Our recovering dieter has arrived when she can accept her human limitations and honestly say, “I am not perfect, and I do not have to be perfect. My ordinary self is enough!” She has learned that affirming self is the essence of recovery. Our recovering dieter has learned valuable lessons upon which to base her new found self-esteem. She has learned that standing up for herself and letting herself be known is the way to gain self-respect and respect from others. She has learned that sacrificing her rights is the same as teaching others to take advantage of her. She now understands that relationships are better in the long run if she honestly expresses her feelings and thoughts and feels empowered to act in direct and appropriate ways. She no longer fears her own anger and the anger of others and has gained confidence in her ability to deal with conflict. Paula is hooked on assertiveness. It has become her principle tool for building self-esteem. Previously, she had confused assertiveness with being aggressive and hurtful, a belief that ran counter to one of Paula’s principle beliefs. She had grown up thinking, “I must never hurt anyone’s feelings. Everyone I meet must like me and approve of what I do. If I am not approved of, it is awful and I have failed.” Early in therapy, she learned the error of this way of thinking along with the crucial difference between assertive and aggressive behavior. When behaving aggressively, you have little concern for the rights and feelings of others. In assertive behavior, you respect others’ rights, but you also respect your own. When there is a conflict of rights and desires, you have a perfect right to tell others what you think, what you feel, and what you want. You have a right to negotiate. Paula now believes that by standing up for herself and letting herself be known to others, she is gaining self-respect and the respect of others. She is no longer afraid of teaching others how she wishes to be treated. - Praise herself, give herself what she wants and believe that she deserves it. - Trust herself and have confidence that her ordinary self is enough. - Forgive herself and talk to herself only with kindness and gentleness. - Allow herself to have pleasure and fun without guilt. - Accept from others, and let in love and affection. - Claim responsibility for herself and follow her own intuition without guilt or fear. - Commit to nurturing herself in a wide variety of ways. Not everyone follows the exact steps above. The order may vary. Stages may overlap. Recovery happens as the conditions we have discussed are met. An understanding of the process instills hope, provides direction, and defeats fear.